Sometimes, the basic information you need to know about a car is right in its name. 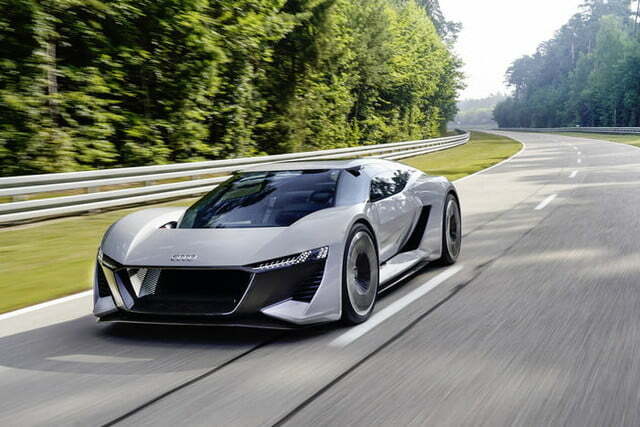 Audi has introduced a concept called the PB18 E-Tron. It made its debut ahead of the 2018 Pebble Beach Concours d’Elegance, hence the PB18 part of its name, and it’s powered by an electric drivetrain, which explains the E-Tron part. 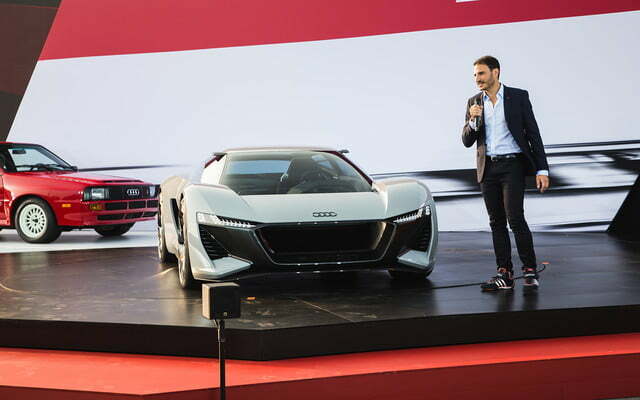 The name also suggests Audi’s newest design study is a tribute to the R18 race car that won the grueling 24 Hours of Le Mans four times in a row before retiring. The PB18 E-Tron rolls paddock-ready technology from the World Endurance Championship (WEC) and Formula E series into a supercar with an eye-catching shooting brake design that blurs the line between a coupe and a station wagon. Sharp headlights mounted on either side of a wide hexagonal grille bring the PB18’s front end in line with Audi’s design language. Autonomy? Not here; this concept won’t move an inch without a human driver behind the wheel. 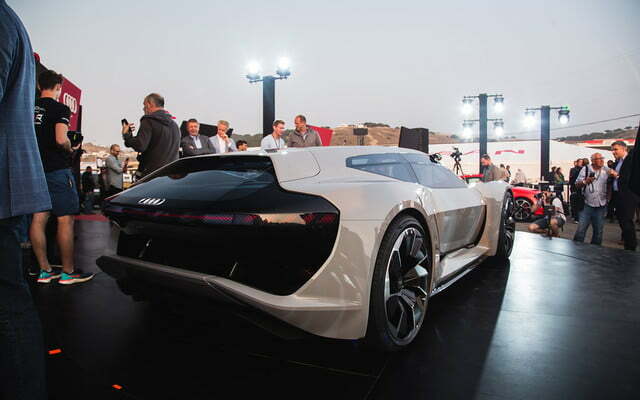 The air vents in front of the rear wheels remind us of the firm’s range-topping R8. 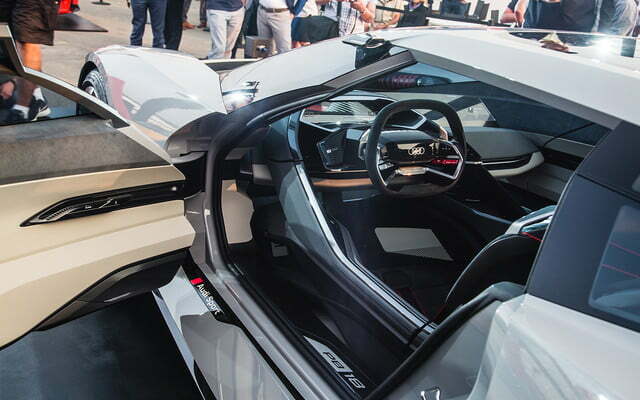 All told, the concept exhibits the typical proportions of a mid-engined supercar without the large-displacement engine normally installed right behind the passenger compartment. 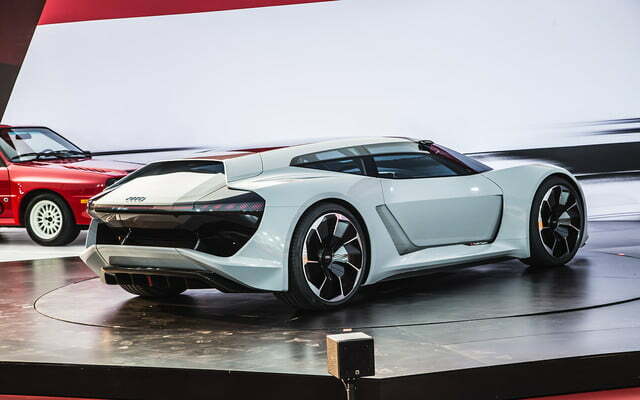 We see some features borrowed from the upcoming E-Tron Quattro, an electric SUV Audi will introduce in September and release globally in the coming months. 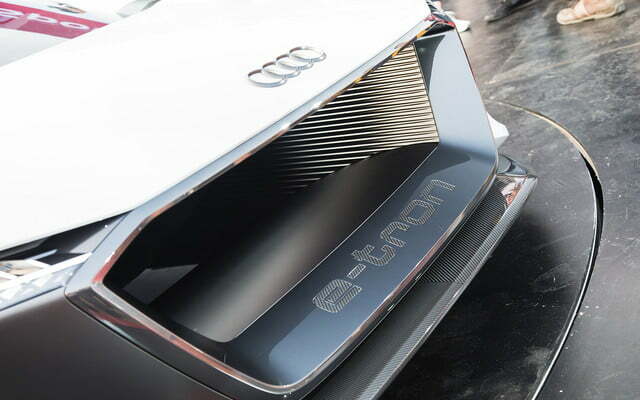 The PB 18 E-Tron uses the same rearview cameras as the E-Tron Quattro. 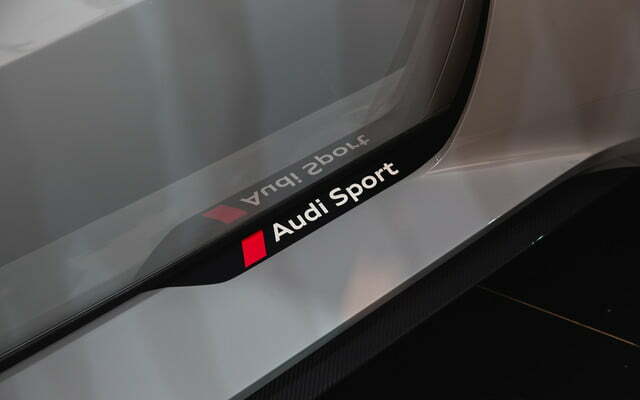 They’re much thinner than conventional door mirrors so they reduce the car’s drag coefficient and boost range. 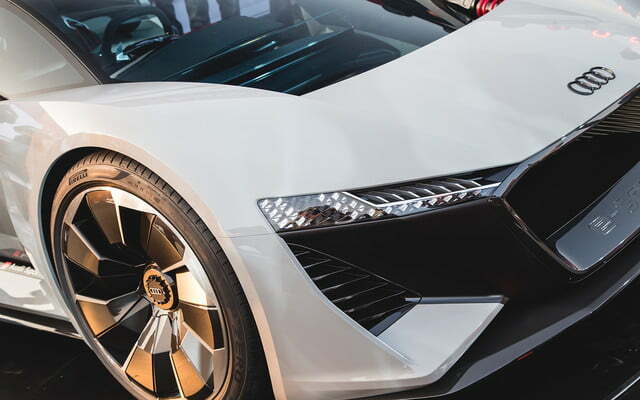 The E-Tron will offer cameras as an option when it goes on sale, though the technology hasn’t been approved in the United States yet. 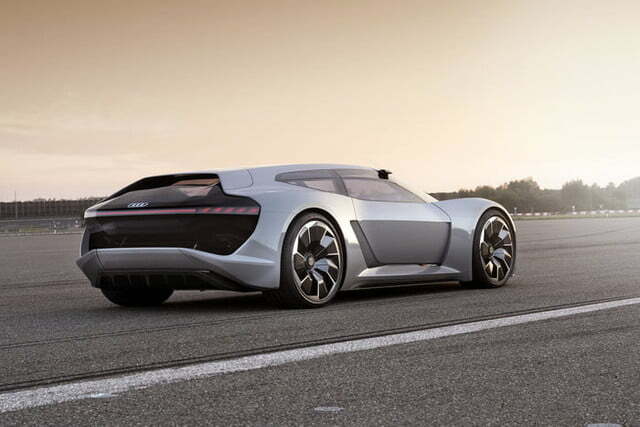 Audi bucked the autonomy trend and instead developed the PB18 E-Tron with pure driving enjoyment in mind. Don’t look for state-of-the-art electronic convenience features like the A8 flagship‘s level-three traffic jam assist technology. 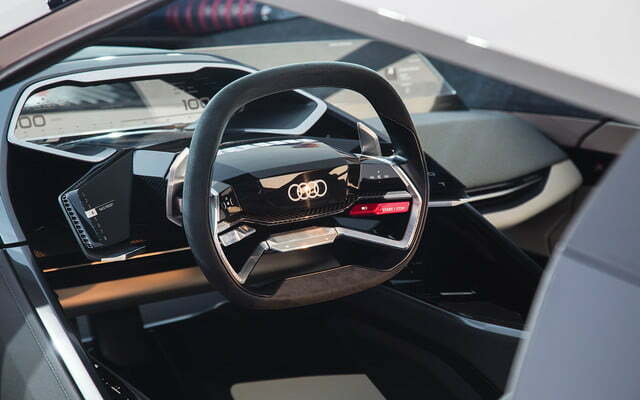 This concept won’t move an inch without a human behind the wheel. Speaking of driving, the driver sits on the left side of the car when carrying a passenger, but the entire cockpit can slide toward the middle of the cabin to make the PB18 feel like a single-seater race car when it’s lapping a track. The two pedals become switches. 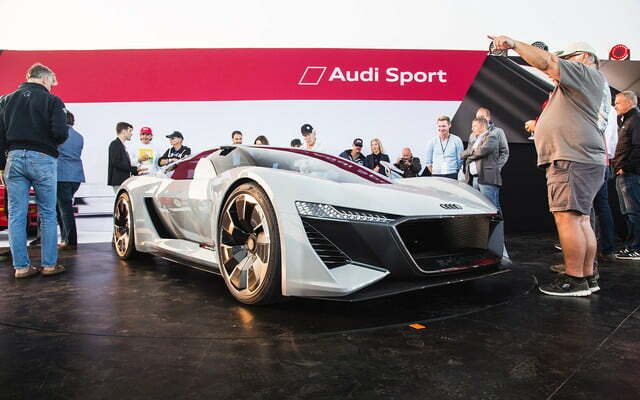 “We want to offer the driver an experience that is otherwise available only in a racing car like the Audi R18. That’s why we developed the interior around the ideal driver’s position in the center. 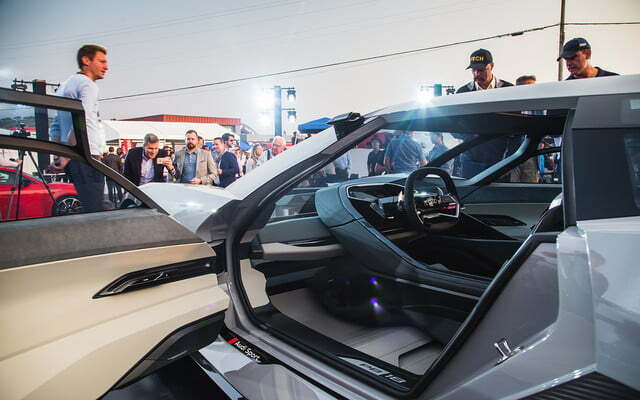 Nevertheless, our aim was to also give the PB18 e-tron a high degree of everyday usability, not just for the driver, but also for a potential passenger,” explained Gael Buzyn, the head of Audi’s design loft in Malibu, California. 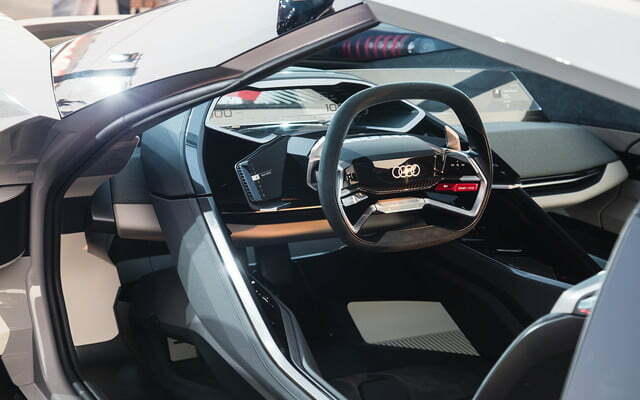 By-wire technology that seeped into the automotive industry from the aviation sector makes this configuration possible by eliminating the mechanical components of the steering and braking systems, like the steering column that normally connects the steering wheel to the steering rack. In this application, the steering wheel morphs into what’s essentially a large dial that electronically turns the wheels by sending input data directly to the steering rack; it’s like a more advanced version of the touchpad on your laptop. 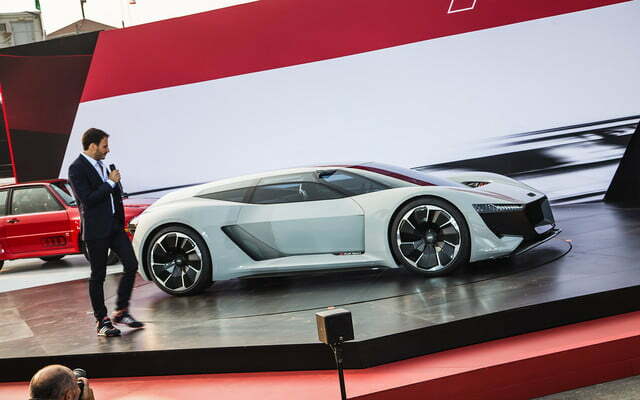 Audi’s electric car offensive will start with the aforementioned E-Tron Quattro and continue in 2019 with the reveal of a second, sportier model. The electric drivetrain consists of a solid-state battery pack that feeds two electric motors on the front axle and one installed in the back of the car. The three power sources channel 670 horsepower to the four wheels, though an overboost function bumps that figure up to 764 for short bursts of time. Torque checks in at 612 pound-feet. 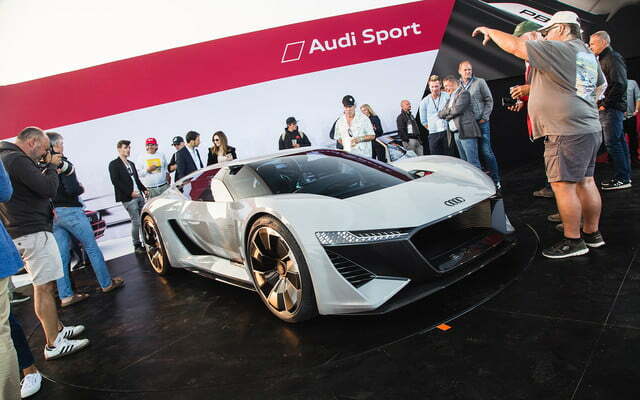 Audi pegs the 3,400-pound PB18’s 0-to-60 time at a hair over 2 seconds and claims a maximum driving range of about 310 miles. An 800-volt charging system tops up the battery pack in approximately 15 minutes. Solid-state batteries aren’t in production yet, so the aforementioned figures are largely hypothetical. 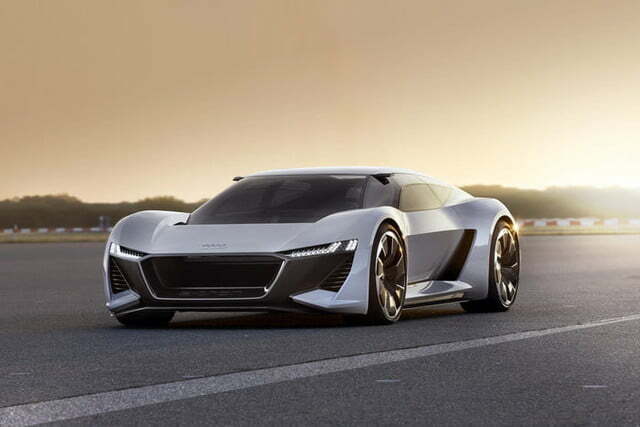 Audi is working on making them a reality during the 2020s. 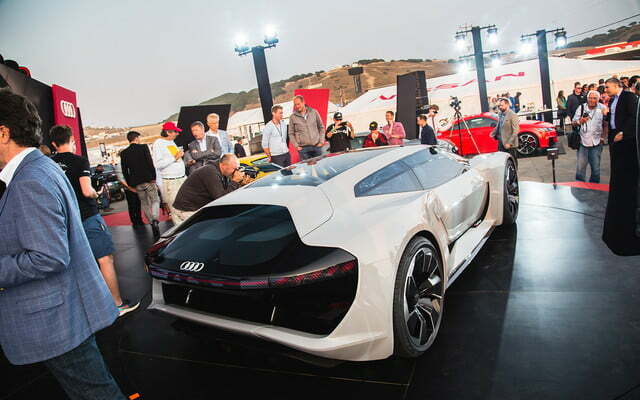 It’s too early to tell what the future holds for the PB18 E-Tron. Audi’s electric car offensive will start with the aforementioned E-Tron Quattro and continue in 2019 with the reveal of a second, sportier model with a fastback-like design inspired by the Elaine concept. The floodgates will open after that. “Shortly after [the Elaine], we’re going to have battery-electric vehicles one after the other, cranking out a lot of vehicles,” Peter Mertens, the head of Audi’s research and development department, told Digital Trends last year. 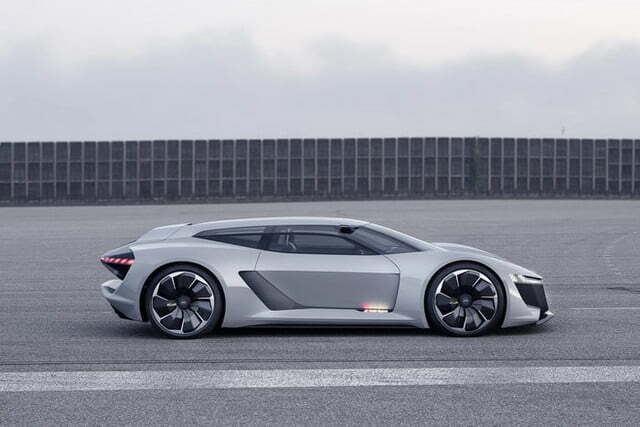 Time will tell whether the firm’s product plan includes a gasoline-free supercar modeled after the PB18. 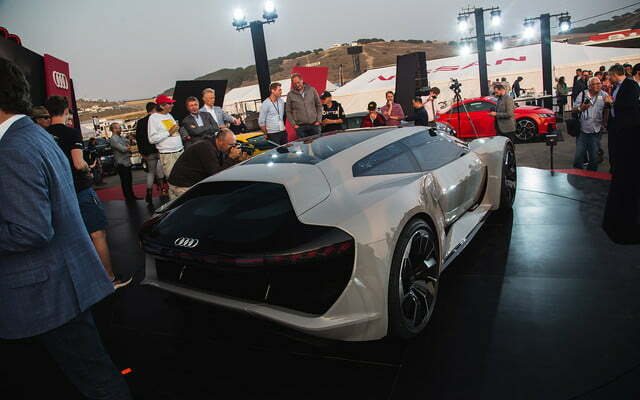 Updated on August 23: Added in-person photos from the Audi reveal event in the pits of WeatherTech Laguna Seca Raceway during Monterey Car Week.